The valuable benefits of +1: Find and get found. Think about the immediate goal of why you are on Google+. #1) You want to find cool things or people #2) you want people to find you. One way to "get found" is to use #1 to achieve #2. Search for people, pages and subjects that you are interested in and that people you would like to have follow you are likely to be interested in. If you have a Google+ page that offers recipes, join communities about cooking, desserts or baking. Look up your favorite chefs to see if they have a Google+ page and follow them. This will allow their posts to show up on your home page. When they post things that are interesting, give them a +1. You can also find the list of their followers and add them to your circles. WHAT IS THE +1 ACTUALLY DOING? When you +1 a post made from someone else, the creator of the post will receive a notification that you have +1'd their post. So, the first thing you are doing is saying "Hey, I like what you just did." Google+ is even so kind to send them a nice notification that you have liked them. If they are curious, they can click on the "activity on their posts" and a list will come up with everyone that has +1'd that post. You can't see it in this image, but if you hover over any of these contacts, the box to add them to your circles will come up, or it will tell you what circles you already have them in. If you have +1'd them, they will find you in this list. +1 also allows you to find members of your target audience in the same way. When you make an original post and other people +1 you, you can also pull the list and follow those people who you know are interested in the subject matter of the original post you made. You don't have to be the creator of the post to pull up the activity list. You can find a popular post that has 100 or more +1s and click on their "activity on post" as well, bringing up, yes, this same list of contacts. Using the example above, this is significant for finding readers for my Dark Days series, which is a loosely based prequel to The Hunger Games. I can go into a Hunger Games related community, find a popular post with loads of +1s, pull that list up, and easily click them into my reader circle (unless they have privacy set up, which most people don't yet because Google+ isn't overloaded). I add them with my Dark Days page, so it is the cover they see when they look to see who added them. It's really that easy guys! p.s. If you enjoyed this post, please click the g+1 button below or reshare, so that others may enjoy it, too! Ginger, Good post. 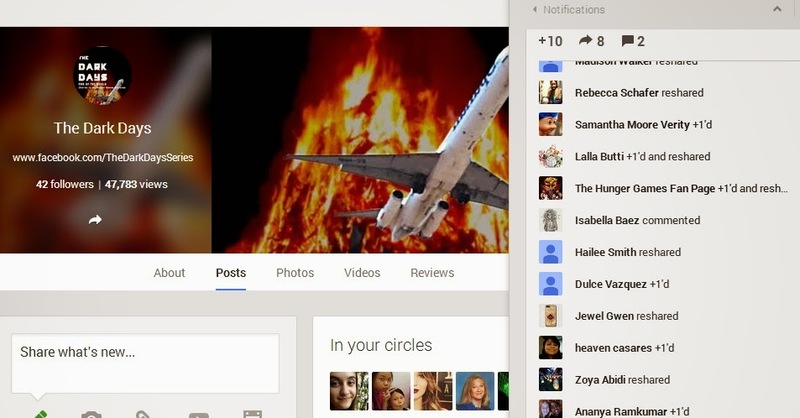 Google + is so overlooked and underutilized. I am just at fault. Slowly bringing myself up to speed on Google + Thank you.